My friends at P&B Textiles have generously offered fabrics for a give away. There are 5 fat quarter bundles! Each bundle will have one fat quarter of each fabric in the line and will be sent to you directly from P&B Textiles. To enter the give away add a comment to this post stating that you would like to be entered. I will do a random number pick of the entries (first comment will be number one, second comment 2, etc). I will select the winning 5 numbers on Nov 27, Thanksgiving day. The winners will have their fabrics in time for a holiday project. They sent me 2 bundles and I am starting to piece a quilt top with the Luxury Essentials line. I am becoming more and more a solid fan. This line is solid but not. The pictures don’t do justice to the gold accent print on the fabric but it really feels like the holidays to me. I wanted to make something simple with all easy cuts and all straight line seams and use all 30 fabrics. A bonus of this design is that there are no points to match up. Here is a block layout of the pieces. 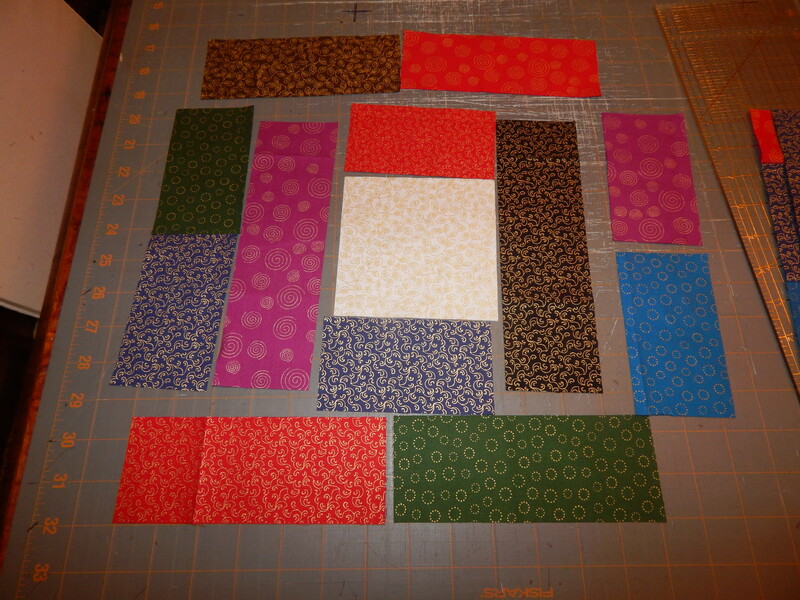 Here are a few completed blocks they are 12 inches square. Every block will be a bit different. I will post more pictures as I get more done. (you know I have at least a dozen projects going at once so it wont be done tomorrow 😉 ) I plan for it to be a full-sized quilt so there will be a lot of blocks! Happy Quilting and good luck in the drawing! This entry was posted in Quilts and tagged fabric give away, P&B textiles, Quilting, Quilts. Thank you for allowing us to have this chance to win a P & B fat quarter bundle. I would love to enter this drawing. Beautiful fabric! Please enter me in the drawing. How generous. I would love to be entered in the give away. I would love some of that beautiful fabric! Thanks for the chance. You always inspire me with all that you do! Beautiful work Tim! Please enter me in the draw. Thank you P&B. Beautiful fabrics. Enter me in! I would love to be entered for free fabric! Tim, I would love to be entered in the drawing for this beautiful fabric. How wonderful! I would any of these fabrics! My grandmother was an awesome quilter, my mother never had the desire and it has been a lifelong goal of mine. Your blog is very encouraging and I have started the journey! Tim: Beautiful fabrics! And blocks! Please enter me…thanks. O Yes!!! I would love to be entered in this giveaway !!! I love the blocks Tim has done with them !!!! What a nice give away. Thank you for entering me into the give away. Hi Tim. Would love to be entered for a chance to win some of the pretty fabric. Love your posts and your dog. He’s adorable. I have a Boston Terrier named Freddie. She is a sweet little girl. I show her pictures of Teddy when you post. Yes, please enter me in the drawing. Beautiful fabrics. Tim, I would love to be entered into the drawing for the fabric. I have so much fabric already though that if chosen I would like it donated to a quilt guild or group that makes quilts for charity. Thank you. I would love to be entered in the drawing! What lovely fabrics. Great blocks! I enjoy your blog. Just in time to compliment the quilts I have planned for 2015! I would love to be entered. Thank you! Unlike many of my fellow quilters, I’ve only been quilting for a year, and I DON’T have a huge stash! I always need fabric! I would love to be entered in the drawing, the fabrics all look so enticing and Tim your daily blog occupies way too much of my time but I love it. You must be the world’s fastest hand quilter. How do you accomplish so much and work too!. Lovely fabrics that would work wonderfully in my house quilts. What a generous giveaway. Thank you Tim and P&B textiles! Lovely fabrics and who doesn’t love a give away? My poor stash hasn’t seen a new friend in ages, I think it’s time. How exciting! I love to look at new fabric lines. The bounty of beautiful cottons available now never ceases to amaze me. I started quilting in the 70’s when and I really had to rummage and ferret for good cotton designs! Fantastic! Please enter me in the drawing! Thanks! How nice of P & B to have you host this giveaway. I would love the chance to win a bundle. 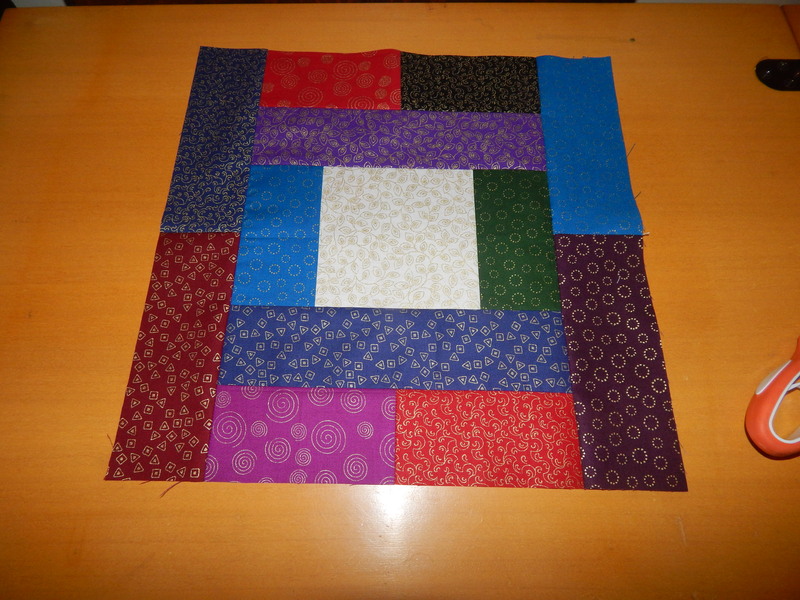 I love your quilt idea…..so simple and no points to match…wonderful! Have fun stitching. I’d LOVE to be in the drawing. The fabric is lovely. Tim, I love your new “solid” block. Thanks for the inspiration! Fabric giveaway? Yes, please! Well, yes, of course! Please enter me in the drawing for the fabric. Big thanks to you for inspiringly beautiful work, Teddy for keeping you in line, and P&B Textiles for offering the fabrics. Beautiful. I would like to enter the drawing. Thanks for doing this Tim and P&B. All the fabrics are yummy and certainly get the creative juices flowing. I would love to win one of the fabric packs. I also enjoy reading your blog and seeing your garden. lovely fabrics! I would like to be entered in the drawing! Very exciting offer, Tim! Would love to win one of these bundles, especially the second one! Tim, I would enjoy playing with a fabric line. Thanks for the opportunity. Please enter me in the drawing, please. What a nice holiday gift for someone! Please enter me for the giveaway! Thanks for all your inspiration, Tim! Thanks for doing this…I would love to enter the drawing. You’re a prolific and inspiring quilter Tim and I love your helpful tips. I definitely use a lot less pins when I layer my quilts! 🙂 Thank you for this fabric giveaway. I would like to get free fabric! Thank you!! Love to watch your quilts progress! Please enter me in the fabric giveaway. I would like to be enter into the drawing. All the fabrics are stunning and I am very grateful that you (and P&B Fabrics) are taking the time to do this for all of us. Blessings to you and Teddy. Please enter me n the fabric giveaway. The fabrics are beautiful. Thanks to everyone. Lovely fabric line ~ I’d love to win! These fabrics are really nice. Please enter me in the drawing. You inspire me to quilt more. Thanks Tim – please enter me in your (and of course, P & B Fabrics) very generous fabric five-away. 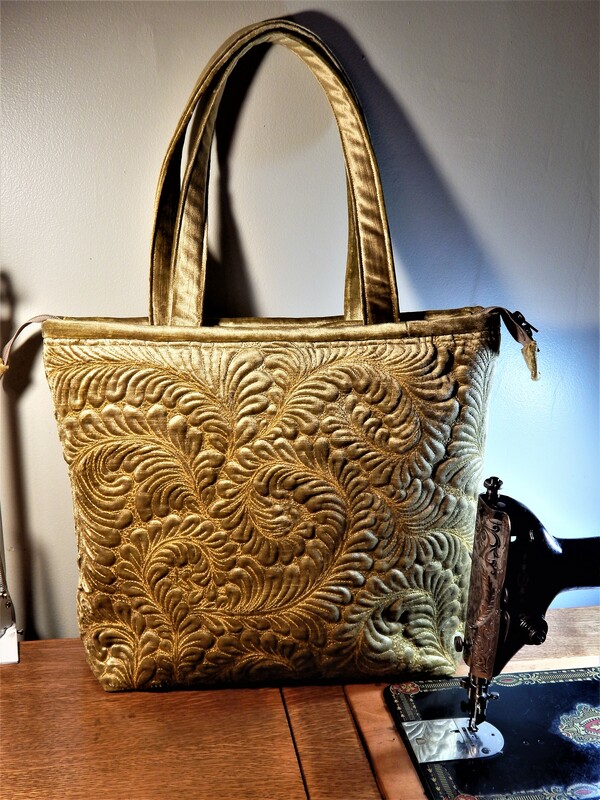 Love the Luxury Essentials and the Bella Suede line and your pattern is inspiring. I would love to be part of this give-away! I would love the opportunity to win free fabric 🙂 Thanks for all you share with us Tim!! Thank you Tim for a great opportunity to win free fabric from P & B. Thanks for all you share with is as well… so inspiring!! I would love to be entered for the giveaway, such beautiful fabrics and love the block you created! I’ll take a chance for the giveaway, please enter my name. me, too, loving the little gold on the fabric, it look festive! Thank you! I would LOVE to win the “Bella Suede” bundle as the colors really appeal to me. Like what you’re doing with those blocks…simple design elements…perhaps ideal for some awesome quilting! Hi Tim, I see that you enjoy P&B as much as I do. I always know that when I purchase a P&B fabric, I’m getting top quality and with the hours we put into our quilts, I like to work with the best. Have a productive day. I would like to be entered in the giveaway. Thank you and P&B very much! I enjoy the quilts you make. Thanks Tim for arranging this, some really beautiful fabrics! Please enter me! I’d love to win any of the giveaway bundles. Thanks Tim and P&B! Oh my, I would love to be entered in the P&B give-away! Too bad Teddy isn’t included. Thanks Tim! Renie L.
Thanks Tim. Would love to be entered. Cool. Please enter me in the fabric give away. Thanks so much. Please enter me in your give-away. I love following your site. I hand quilt too and am amazed at how much you accomplish. Thanks for the inspiration. yes , I would love to be entered. Such gorgeous fabrics! Please enter me in the drawing! And thank you for the lovely blog! Also- a shout out to Teddy!! I would love to be have a chance to win these lovely pieces. What a generous giveaway! I would like to be entered also. Thanks very much. these fabric lines are fabulous and I would love to win one of the giveway packets! Tim, you are spoiling us. As if all your wonderful posts weren’t enough to keep us spinning with ideas, now you are giving away fabric. What a treat. Hope I win! i would love to win all beautiful fabrics. I would be pleased to win…thank you. Those folks at P&B are sure creating gorgeous fabrics! 🙂 I’d love to win any of those bundles. Those fabrics look luscious. Would love to win some for my stash. What beautiful bundles of fabric! I would love to win one of these. Please enter my name in the fabric giveaway. Thanks. Wow! Please enter me in the drawing. Thanks to you, Teddy, and P&B Textiles for the giveaway! Tim at this time of year with the bad weather (even in Florida), Island Breeze would be a wonderful breath of fresh air. Please put me in the drawing. A new quilt!!! Happiness is starting a new project. There are some beautiful fabrics there. Please enter me in the drawing, and thank you so much for doing such a great thing! Tim—-Needless to say—-I LOVE fabric. I made a prayer quilt using the block pictured on this post. Made the mistake of using 1″ strips and it was far too labor intensive for this project. Look forward to your results. Thanks to you and P & B for a fun drawing. Didn’t read you yesterday and am far down on the list. But maybe I will be lucky. Love the block you are making. Just love all your work. Have a good day. What a great giveaway. The fabrics are gorgeous. I’d love to win any of the bundles. Thanks to you and Teddy and P&B for sponsoring this. I would love to enter. The fabric is just beautiful. I’d love to enter your drawing too. Always enjoy your emails but better yet was your lecture! Any guild looking for a speaker should book you! I don’t hand quilt but so enjoyed the hour with you. LOVE the “Bella Suede”!!!! I can see this in the hoop on my embroidery machine now!!! Thank you for the opportunity to win one of these fabulous giveaways!!!! Oh how delightful! Please enter me in! Thank you for the drawing. 🙂 love your blocks!! Would love to win these fabrics,they would grace any quilt. All the fabric is beautiful !! Please enter me in the drawing. What a great thing for you and P&B to do. I just love your postings and admire your quilting. If I were to win any of the bundles would be great but I the Fontaine calls out to be in my POTC blocks. Thanks to P&B for the beautiful fat Q bundles. Gorgeous fabric. Enjoy reading this page. Please enter me in your contest. Thank you. Please enter me in the drawing. I am amazed with your ideas and hand quilting. I used your large stitch quilting for my new grand baby quilt. It was lovely. Oh, what a fabulous giveaway! Those fabrics are so gorgeous. Please enter my name in your giveaway. Thank you! Pleas enter me in your give away. Your quilting always amazes me. I would love to be entered in this drawing – the fabrics look amazing! Linda Sophiasworth here, please count me into the drawing! 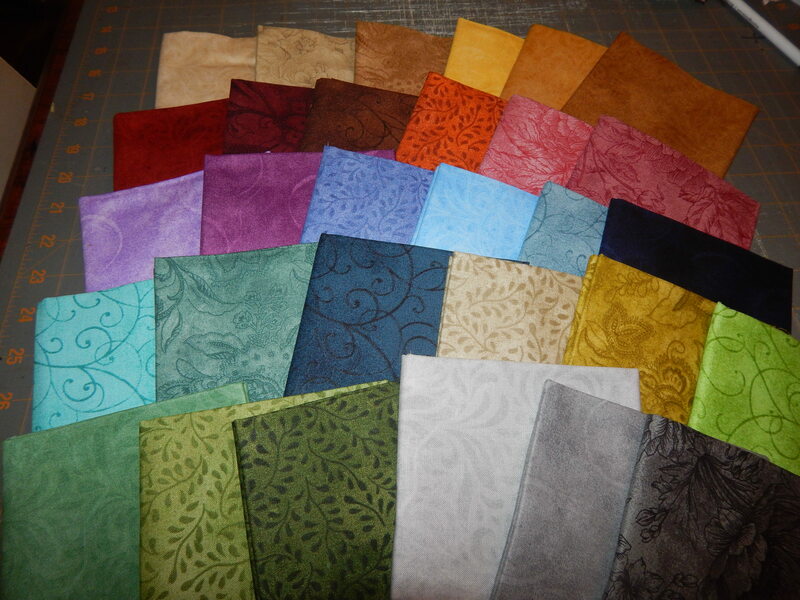 I would like to be entered in your drawing for a P&B fat quarter bundle. We quilters can never have enough fabric! (Especially those of us who have been quilting long enough to have a mostly ’90s stash! I need NEW fabric!) Thanks! Please enter me for this draw as the stash always needs a top up and this will be a great way to sample some new ranges. Hi! Please enter me in the fabric give away too. Thank you! Please enter my name in the give away… thanks so much! Oh – how fun. I do love solids or nearly solids, and the prints would test my creative side to produce something wonderful. Wonderful Holiday Drawing. Thank You and P&B. All of these fabrics are beautiful. I’d just like to say how much I enjoy the pictures of Teddy. I have a black Schnauzer named Clara. I would love to have these fabrics. Thats one thing that don’t get bought very often here, as my husband has been laid off in the coalfields of Va. for over 2 years. They are beautiful fabrics. Thanks for entering me. Fantastic giveaway!! Thanks for the chance to win! What beautiful colors! Please enter me in the drawing. Thanks! Many thanks to you and PB Fabrics. Please enter me in an opportunity to win some of these beautiful fabrics. Beautiful fabrics! I’d love to be entered. I would love to enter your giveaway please. Your fabrics are lovely. Count me in, too, Tim–thanks! The Bella Suede fabrics are right up my alley! Thanks for the opportunity to win, Tim and P&B Textiles! I’m in. Love the sueded bunch!! Please enter me in your drawing. Thanks! Lovely fabrics. All of them. Love the fabrics – please enter me to win and thank you and P&B. Hi Tim! What a wonderful thing for P&B to do. It’s amazing how thoughtful and giving just about everyone involved in quilts and their process are. I’d love to be entered for the free fabric give-a-way. Thanks to everyone involved. luxury is great and the island breeze enter me in the drawing please. Please include me in the drawing. How lovely that P & B made this possible. What a wonderful giveaway-yes, please enter me in the drawing. I would love to win. I get inspiration from how much you get done! Would love to win any one of those fabric bundles – an early Christmas present! Beautiful fabrics–please enter me, too. Thanks for the giveaway!! Just joined your blog based on recommendation. Really admire your work. Would love to win some of this beautiful fabric. Thanks for the opportunity. Stay warm! Please add my name to the “pool” for the drawing. Wonderful fabric lines. I’m in. Love the fabrics. Please enter me. I would love to win! Thank you for the opportunity. Hope you and Teddy have a wonderful Thanksgiving. Thanks for your offer. This is “pass it on” in the best way. I follow you daily and appreciate your fine photos, your explanations of how you work, and your furball, Teddy. How pretty they are. Please enter me in your drawing. Please enter me 🙂 this is very generous of P&B textiles look forward to seeing your quilt from the new fabric. Yes, I definitely want to be entered in the drawing(s). Have been a follower for a long time, just not a verbal one. Bella Suede is my fave!!!!! Wow! That’s nice fabric. Please enter my name in your contest. Would love to be entered into the contest.. The fabrics are beautiful!! Thank you P& B and Tim and Teddy.. Please enter me in the contest – thanks so much. Thanks to you, Tim, and P and B Textiles for the giveaway. I’m a fabric junkie, and think these are gorgeous. Looking forward to seeing your progress on the new quilt. Does it have the Teddy seal of approval yet? Yes. Please enter me for a chance to win this beautiful fabric. I love the P&B designs. Thank you for this opportunity. Pick me, Teddy. Hug. I would appreciate being entered in the drawing. Thanks Tim as well as P and B textiles – All the fabrics look great! Would love to be entered into the contest. Hi TIm I would love to have my name added for the draw. They are all beautiful fabrics. It’s raining here in Florida today. Good day to quilt. Take care and thank you. What a wonderful giveaway. Yes, please enter me in the drawing. Wow what lovely fabrics! How generous of P&B Textliles! Max thinks he would great on a quilt made with all these wonderful colors! Thank you Tim, the fabrics look lovely and I am about to retire and spend more time quilting. Thanks for offering this give-away. Beautiful fabric and a very interesting block. Again thanks and stay warm. From northern Iowa. . . . Thanks for a wonderful opportunity to win these gorgeous fabrics! Also, I can wait to see how your project turns out. I’m predicting “Stunning” as usual! What a generous giveaway! Lovely fabrics. Can’t wait to see what you create and how you quilt it. It is always amazing! Yes please! I would love to be entered into the giveaway for such gorgeous fabrics 🙂 Many thanks! Gorgeous fabric! Would love to be entered in the drawing! I would love to win any of these! Please enter me in the giveaway. I made a quilt a few years ago with a similar block. The quilt looked complicated but was actually easy to make. Love all of those fabrics. I would love to win a bundle!! Thank you and P&B!! Oh my, I’ve never entered in such a give away, but these look to good to be true! 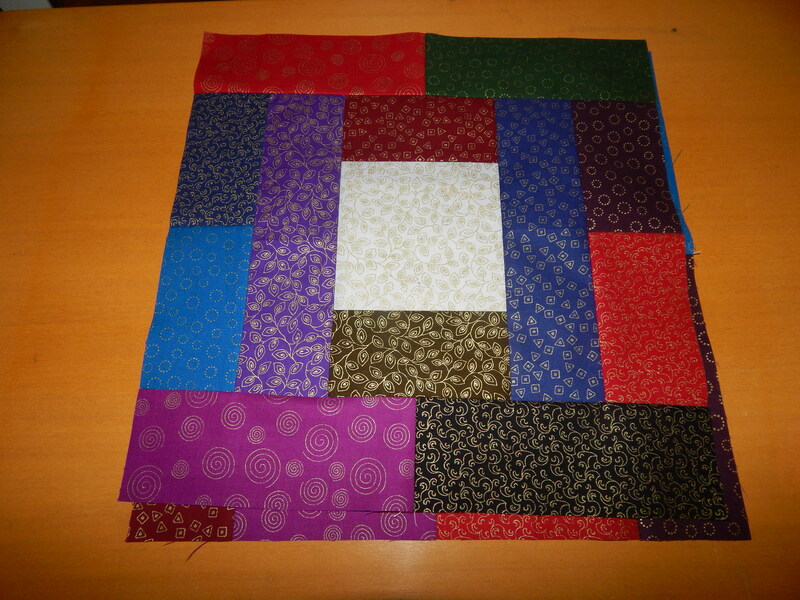 I love your stuff and would love to have the time to hand quilt, If I do quilt I have started big stitch quilting. Always looking for more fabric, enter me one the fabric draw. thanks Tim for the giveaway. Yes Please enter me in the fabric giveaway! Oooh! I’d love to win some great fabric!! Your creations are breath taking! The fabric in this drawing is awesome! Pick me…Pick me said the quilter to the random name puller. Good Luck me and everyone here!! Thank you Tim for hosting this. I would love to be entered for the giveaway and do appreciate the chance to enter. I have never won anything like this before and would be honored to receive this gift. Lovely give away. Lovely fabric too. especially island breeze. Hi Tim. Thank you very much for the giveaway. I’d love to win any of these beautiful fabric bundles. Those would look great with some fabric I already have! Love your entry Christi…lol…best of luck! I have been following you for quite a while. 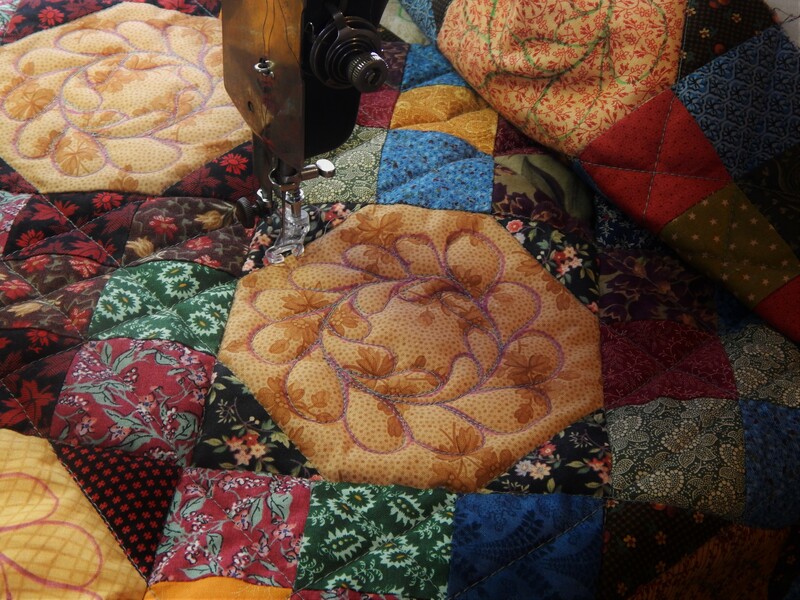 I love vintage quilts and hand-quilting! Please enter me in the fabric giveaway! Yes please enter me! Beautiful fabric! Thanks for hosting the giveaway, Tim. Please count me in! Thank you P&B fabric and to you Tim for hosting! I certainly want to be counted in! Please Tim enter me in this give-a-way. what beautiful fabrics! Love your website and Teddy! Please , I would love to be entered for give away fabric! and I love the simple blocks your doing with the fabric in this post. I would so love any of the beautiful fabrics offered here!! Tim, you have become one of my favorites! Please enter my name. What beautiful fabric. Thank you for all the pictures showing your work. The fabrics are gorgeous! Please enter me in the contest! I need to make two baby quilts for expectant mothers who were both told they could never conceive! What a generous gift from P&B & you Tim! Thank you. Love the new blocks!! Count me in Tim! I would enjoy having a chance to work with these lovely fabrics. Looking forward to watching your progress as well! You have great friends. Would love to be entered. I have been enjoying your blog posts as a recent follower. Cannot wait to see how you pull your blocks together. Please enter me in this fabric give-away. All the lines look fabulous. Beautiful fabric & amazing work, Tim! Thanks for your inspiring blog posts, and for this fabric acquisition opportunity! I would like to be entered in the drawing. I think Teddy needs to help pick. Please enter me in the drawing. I always look forward to posts from you and, of course, from Teddy. I would like to be entered for a chance to win some of this lovely fabric. Oh Tim, such a feast for the eyes.I’m feeling a need to draft a pattern that would do these lovely prints.I’m usually a solids girl but these really would add zing to just about any solid color.I’m inspired! Tim – enter me in the drawing. Love the Bella Suedes, but any of them would be wonderful to win. 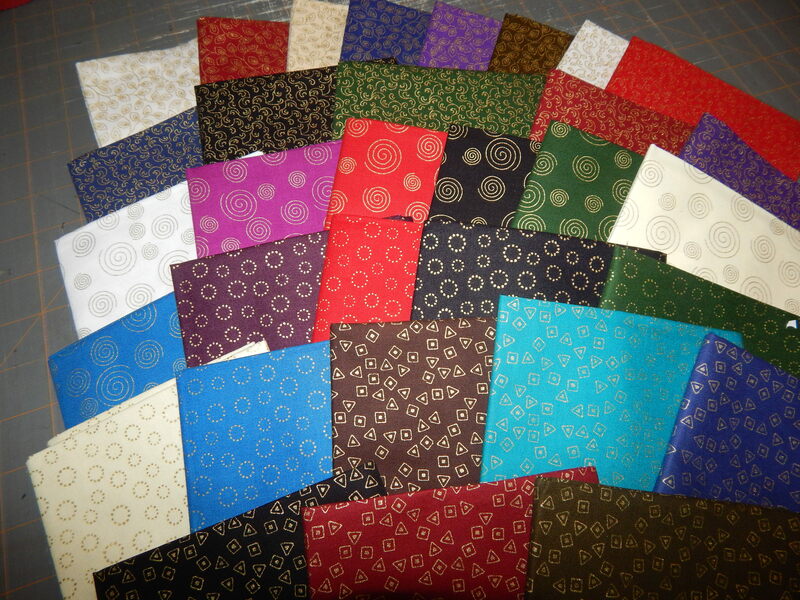 The fabrics in to the new blocks where my favorites of the bundles. Thanks for you inspiring work. Please enter me in the drawing for the fabric give-away! Love all of them! Tim, I would like to be entered in the drawing as well. P & B Textiles have given you some delicious fabrics! Thanks for the opportunity to participate in the drawing. To win would be an early Christmas gift! What gorgeous fabrics, the Bella Suede just really grabbed me. I do so enjoy seeing your quilts and the progress on the snowflake. Teddy is always such a joy to see. Keep up the good work. Please enter me in your giveaway. The fabrics are lovely! I’d love to enter the fabric drawing! Tim, I would love to win one of your fat quarter bundles. Please enter me in your giveaway. Please enter me in the giveaway. I like Blissful Moments best followed by Island Breeze. What a cool opportunity! The website has a lot of pretty fabric. I really like FLYING SWEETLY. Beautiful fabrics! I would live to play with some. This is a great giveaway. Thanks for the chance to win some great fabric. Love your new project. Thank you Tim and P & B for doing this. 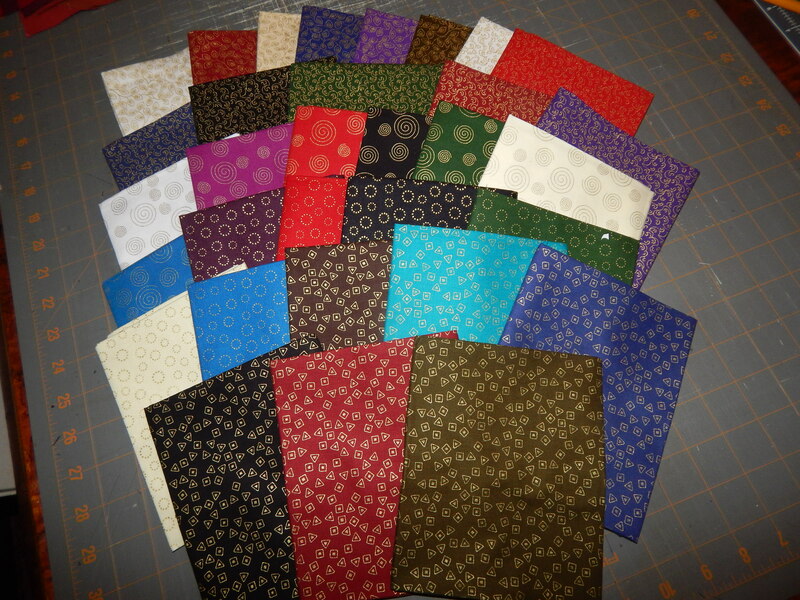 I have not added any new fabric to my stash in quite some time. Would love to win some of this great fabric. Love your quilts and especially how much Teddy loves them too. Enjoy your blog very much. Thanks for letting us play. I want to play. Please entry me into the giveaway! I hope my last comment went through…but just in case, please enter me in your give away…love your posts! I also want to be entered in the giveaway.. so many wonderful bundles. Having a hard time deciding on my favorite one.. I would like to be entered! Thank you! Would love to win some fabric! Could I be entered in the drawing? Thanks Tim! Love following your blog and your adventures in quilting and gardening….and Teddy too! Thanks for the opportunity! Please enter me in the drawing. I would love to win that gorgeous fabric! Thank you. Love your work. Thanks Tim I would like to enter your Give Away. The Luxury Essentials that your using are a great combination of fabrics love them. Would be a lovely birthday/Xmas present for me. Live your work and inspiration. I would like to be entered in the drawing. The fabrics are so pretty yet each collection is different. Did Teddy choose his favorite? I guess he only likes having his picture taken with quilts. Thanks for the opportunity! I have followed your blog for some time. I love your quilts and your little dog Teddy. I would love to win some fat quarters. Beautiful. Thank you. Hi Tim and Teddy. If the draw includes Canadians please put my name in, All the fabrics look great! Thank you. I would love to win a fat quarter bundle. I would make a warm quilt out of it. WOW, how wonderful! Thanks for hosting! Happy Quilting! How nice to be able to win fabric, good luck EVERYONE! That is some really pretty fabric. I am getting where I love tone on tone. Thanks for the chance. Tim I would love to be included in this giveaway. Such beautiful fabrics. Teddy might need a quilted jacket for this cold snap. Wow what beautiful fabrics! Lots of possibilities. Would love to win. I am constantly learning from your posts. A gift of fabric would be frosting on the cake! Who wouldn’t want some of that beautiful fabric!! I always enjoy watching what you are doing, and learning from it. Please enter me in the drawings! I’m a sucker for new fabric. Please enter me into the P&B drawing. I always love seeing all your projects. You are so ambitious! I would be most grateful to be entered in the P&B Textiles (and Tim & Teddy) fabric give away. The lines look gorgeous! I can’t wait to see what you make and how your going to quilt them. Each group is has it’s own stand alone beauty. I would love to work with them. Would love to be entered in the drawing for the fabrics. How can anyone refuse. Love your stuff – you are amazing! I was looking at hand quilting and found your awesome blog! Thank you for the giveaway. I would love these fabrics to try one of your techniques. if I don’t win (and I am sure I won’t! ), love seeing the new stuff! I have already received a gift…….seeing what you have done each day! I would love to be entered in the fabric giveaway. I would also love to be entered in this give away…Thank you P & B, Tim Latimer and Teddy. They are all lovely new lines. Always love reading about your work — so fine and so productive. Love the fabric and wish to enter the give a way. As it took me almost 3 minutes to scroll down to bottom, I am very impressed with all your friends. Please enter me! Thank you for your blog! Thanks for the chance to be in the draw – I love the line called Bella Suede. I always enjoy the posts from you and Teddy. Thank you Tim for the opportunity to win one of these fabric bundles. Tim, you’re always so generous! Thanks for sharing and the opportunity to win fabric! Thank you for doing this and please enter me! I hope you have a wonderful holiday! What beautiful fabrics! I would love to win one of these collections. I would like to be entered into the giveaway. Your work is beautiful, I am new to quilting and you have inspired me to try hand quilting. I would love to be entered to win one of these collections!! Please and thanks! Tim you always do beautiful work. I love the colours of your give away. Please enter me in the draw. Thanks! Those are yummy looking fabrics! Thank Tim and P&B for the chance to win. These all look like excellent stash builders and fillers. Can always use more of those! Thank you for the opportunity!! What quilter doesn’t love fabric?! … and a chance to win! Yes, of course I want to be entered! The number of comments already should be a great indicator of the popularity of your blog. I would love to be entered in the free give away!!!! THANKS SO MUCH FOR THE CHANCE TO WIN THE FABRIC. HAVE A GREAT THANKSGIVING. How nice for you to be able to do a fabric give-away. I would like to be entered please. The give away gives me a nice excuse to finally comment and tell you that I really enjoy your blogging. I learn many interesting things from your posts and really enjoy seeing the progress on your projects. Thank-you for taking the time to share your work with us. I would love to win, thanks for the chance Tim. would love to win one of these beautiful fabrics. Tim, thank you for the chance to win a lovely fabric bundle. (I could use a little lift this month :). These fabrics are beautiful. I would love to be included in the drawing. Please add me to the drawing. Thanks! Absolutely, positively enter me in the drawing! Besides being beautiful fabric, one can never have too much fabric! Yes please. I would love the opportunity to be in the drawing. Thank you. The collections look wonderful. Please count me in and thanks for the chance to win! I would like to be entered in the drawing, Thankful for YOU; for sharing and inspiring me throughout the year! Love all of these and have never seen any where I am in Maine. Oh, how fun! Please count me in too. Thank you P & B Textiles and Tim for your generosity. Love your blog and would love to win one of these fabric bundles. Tim, I would LOVE to win fabric. I’m a solid fan too! What gorgeous fabrics! Thanks for the give away. Please enter me. Hi Tim, as you know I read your blog everyday. I thought it was so sweet of Kati Chiconi to offer to pay the postage if she wins because she lives in Australia. See when folk read the comments often they recognize other regular commenters. How did you do in the entry of the snowflake quilt? Love love love the “Bella Suede”! Thanx for all you do! I’d love to be entered! Thanks for the chance at some great fabrics. Yes! I would love to be in the drawing…..love all the fabrics! Thanks for the great giveaway! Dear Tim, please, enter me in the drawing. Dear Teddy, please, make me the winner, you know how much I love you. Enter me too, please! What a nice give away before the holiday’s. Someone is going to feel very lucky! I marvel at your hand quilting. I hope I can do nearly as well when I grow up, and I’m 65! What lovely fabric! Please enter me in the give a way. Tim, I would love to be entered in your drawing. More importantly I look forward to every posting. You are remarkably productive and do beautiful work but in a non-crazy perfect way. I hope that you and Teddy have a Happy Thanksgiving. Please enter me into the drawing. Yes please enter me into your fabric giveaway contest! I never win but i keep trying! These bundles are awesome! Thank you and good luck to all! Tim, I really enjoy seeing all the beautiful vintage quilts and the hand quilting. I hope I win some fat quarters. Please enter me in the drawing. Thank you so much, I would love to be entered in this wonderful drawing. I love reading your blog and watching you quilt. Hope you have a wonderful Thanksgiving! These are gorgeous! Thanks for entering me in the giveaway! What a generous give-away! Thanks for inviting us to participate! I would love to enter the drawing for the fabric. You are an inspiration for finishing all the old quilts by hand quilting. I would love to win the fabric as if I didn’t have enough already. I would love to be entered in your fabric giveaway. Wow, so many beautiful fabrics; Island Breeze is my favorite. Count me in – thanks! I have admired your work for so long! Love the various fabric packs! Please enter me in the beautiful fabric giveaway. BTW your Christmas quilt utilizing the vintage tablecloth is gorgeous. Must try that with some cloths I have. One can never have too much fabric to choose from when picking out pieces for a specific project. Thank you for the chance to be a winner! Tim, I have been a lurker, a longtime reader and admirer of your work, and a member of a minority group: a hand quilter. Love your blog, inspired by your work! Thank you for sharing your quilting life with us. I nearly always read your blog, but don’t often comment. Your work is so inspiring! Thank you for the opportunity to enter in this wonderful give away! 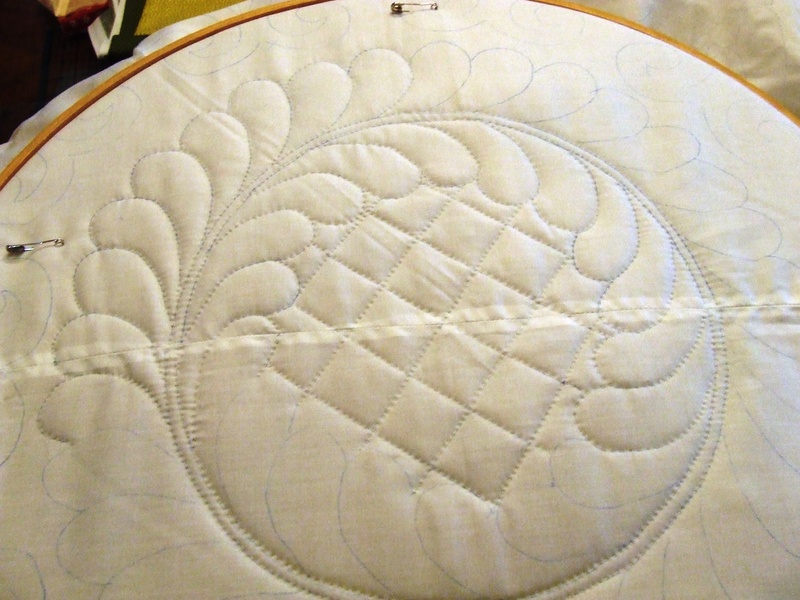 Hi Tim, you have inspired me to get back to hand quilting and try some Big Stitch also. Love the fabrics, and would love to be entered in the giveaway. I love all the fabric and your new quilt blocks. This looks like a great quilt with all the beautiful fabric. I would love a chance to win, thanks for the opportunity. Would love to be in the draw – if I’m eligible (UK)? I love solids too. Hope I win. I would love to be entered in the draw. Since discovering your blog a couple months ago, I have enjoyed watching your progress on all your projects. All the knowledge, tips and tricks you share have been stored for future reference…hopefully, I will be able to access that stored info when I need it. Though I have yet to finish either of my two very small hand quilting projects (begun about 20 years ago) I can appreciate what you do…and marvel at your productivity. I love the big stitch projects too, and that may be some handwork I would actually finish. Thank you so much for sharing. I would love to be entered. These are beautiful fabrics! Tim, I can’t tell you how much I enjoy following your work. I’m gonna have to try a little hand stitching. Any pointers on what would be a good place to start? When you write a pattern for your whole cloth quilts do you suggest the type of stitches to use in different areas, or is that up to the quilter to decide? Thanks you dear Tim for sharing your work and this gift of fabric. Your site is an endless source of inspiration and joy. Please enter me in the giveaway. I love reading your blog. And have a Happy Thanksgiving! What a lovely gift to get for Thanksgiving, an armful of beautiful fabric. I’m sure that my dog, Beau, would approve. Please enter me! Beautiful fabrics! Sure would like to win! Very beautiful! I so enjoy seeing all the quilts you make and actually finish, Tim.! Is it my lucky week? hope so! Bella Suede is beautiful. I’m looking forward to seeing what you will do with those fabrics. Something gorgeous, for sure! I don’t need more fabric. I don’t need chocolate. What I need and what I want are usually two different things. Thanks for entering my name. And Happy Thanksgiving to you and Teddy. Such beautiful fabrics! I would love to win any one of those collections. Love your new quilt. These fabrics are lovely. I too am leaning more toward fabrics that read as solid. Please enter me into the drawing. I love these fabrics! My friends and I are doing a BOM of our own design and these would be great in it! Hug Teddy! I’d love to be entered in the drawing for the free fabric; especially pretty are the Bella Suede and Island Breeze fabrics! Love your pup–I’m sure a most worthy quilt inspector! Could I be entered in the fabric giveaway? The fabrics are great! Tim love your blog!! Please enter my name in the fabric give away. I am a poor retired school teacher who loves to sew. 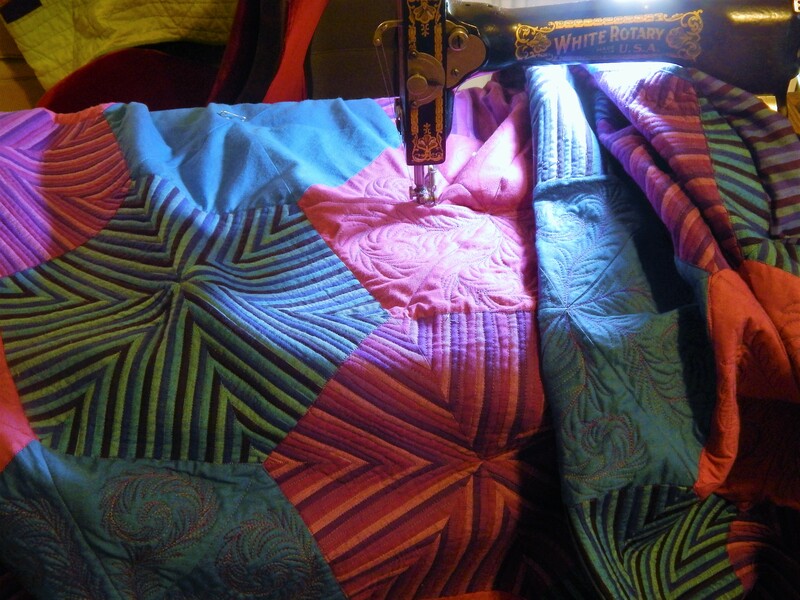 I recently found your blog as I was researching hand quilting. While I learned to hand quilt years ago I have recently decided to try hand quilting again. Your blog is fantastic. Thank you so much for your generous sharing. follow your blog…..I commented……and hope that I was entered for drawing……but I don’t seem to appear on this VERRRRY LONG LIST….so here I go again…….just the thoughts and daydreaming plans are brightening another Rainy Dreary Day! Yes enter me into the drawing! The fabric bundles are gorgeous! I would love for my name to be entered into this giveaway. Thanks! Wonderful collections, love the colors. Great, thanks for the giveaway! I would love to be entered in this giveaway. The fabric lines look wonderful. Thanks for the chance to win and for the inspiration you give all of us with your fabulous hand quilting. Please enter me in your giveaway. All of the bundles are beautiful. Thanks for the chance. Good thing you decided to use random generate, to get one number from 385 would be hard for your dog. Count me in, please. I would like to be entered in the giveaway, thanks for the chance to win. Have a great day! I would like to be entered in your drawing. Too bad Teddy can’t pick the winner! I’d love to entered in this gorgeous giveaway! Thanks for the fun, and thanks for your inspiring blog! Count me in, Tim and THANKS!!! I so enjoy reading your blog! Oh yes, please enter me in the bundle giveaway! I think Teddy can certainly be trained to say my name for the winner…he looks like a smart dog. I would like to win the fabric, please enter me into your drawing. Thanks. Love the Teddy comments. I would love to win any of these fabrics. Let me know if Teddy learns to draw names. I’ve got 3 I could teach. These are beautiful bundles! I look forward to seeing your finished quilt! Really love the fabrics, specially the Luxury Essentials and Bella Suede and wouln’t mind joining in the drawing. YES! Please select me! Love your posts and seeing Teddy! Love your work and love that oh so cute Teddy. Thanks for a great giveaway. Happy Thanksgiving! I would love to win these fabrics! I love the fabric colours in your giveaway. Happy Thanksgiving. My stash could use an update! I hope I am the winner. Tim you are so wonderful to offer fabric to all the quiltaholics that follow your blog. Yeah for P&B – love their fabric. I used to have a wire haired terrier so I’m especially fond of Teddy too! Beautiful quilts !! Please enter me in your drawing. I would love to win. Thanks for the opportunity, Tim. You are The Bomb! Hope you have a wonderful Thanksgiving! Love reading your blog & seeing your work! Please enter me in the drawing for the fabric giveaway. I would love to be entered for this giveaway.